Swami Sivananda Saraswati (September 8, 1887—July 14, 1963) was a Hindu spiritual teacher and a well known proponent of Yoga and Vedanta. Sivananda was born Kuppuswami in Pattamadai, in the Tirunelveli district of Tamil Nadu. He studied medicine and served in Malaya as a physician for several years before taking up monasticism. He lived most of the later part of his life near Muni Ki Reti, Rishikesh. He is the founder of The Divine Life Society (1936), Yoga-Vedanta Forest Academy (1948) and author of over 200 books on yoga, vedanta and a variety of other subjects. He established Sivananda Ashram, the location of the headquarters of The Divine Life Society (DLS), on the bank of the Ganges at Shivanandanagar, at a distance of 3 kilometres from Rishikesh. His Holiness Swami Sivananda was born in Pathamadai in Thirunelveli district, South India. Ever since his childhood, His Holiness was totally devoted to serving others. He worked very hard and graduated in Medicine. As a doctor he earned money but could not obtain peace of mind. He realized that earning a lot of money does not mean earning peace and happiness. Instead, spiritualism alone can help one attain MUKTHI or MOKSHA. His mind was in search of peace and was in a quest for the ultimate purpose of being born in this world. He felt that everyone must have a goal in life and one must lead one’s life with purpose and meaning. Swami Sivananda proceeded to Rishikesh in North India, where he realized his goal while sitting on the banks of Ganges. He advocated non-violence, truth and worship. Many were impressed by his simplicity and teachings. He gathered a lot of followers and in due course, a mission was started in a small hut which today proudly stands as SWAMI SIVANANDA SARASWATHI SEVASHRAM at Rishikesh. His teachings were simple and he saw God as Omnipotent. He advocated the principle that „ONE CAN FIND GOD IN HIS/HER OWN HEART BY BEING HONEST AND LEADING A SIMPLE LIFE“. He believed the teachings of the Quran, Bhagavath Gita and Bible to be the same. He also believed that there was no need for one to go in search of God, as one can find God in their own hearts by not being selfish, but by making sacrifices for others. Many devotees all around the world were fascinated by his teachings and started several missions in Yoga, Siddha and other spiritual awakenings.The late founders of Sivananda Ashram, Sri S. V. Iyer and Dr. V. Mangalam, started this organization after being enlightened by Swamiji that the only real happiness a human being could find was by serving others. We hope Swamiji’s teachings inspire and motivate all of us to do what we can to help others lead a better life. Shri. S. V. Iyer and Dr. V. Mangalam, an elderly couple, started Sivananda Saraswathi Sevashram in 1945 with just 3 kids and with the blessings of Swami Sivananda of Rishikesh. More popularly known as „Sivananda Ashram/Orphanage/Gurukulam“, the organization has grown to be a very well known and well recognized social institution in the country today. We are a „National Awardee“ institution recognized by the Government of India in 1983. Sivananda Saraswathi Sevashram is a non-profit organization with the primary objective of protecting orphans, destitute women, the physically handicapped, AIDS-affected children, and the elderly. 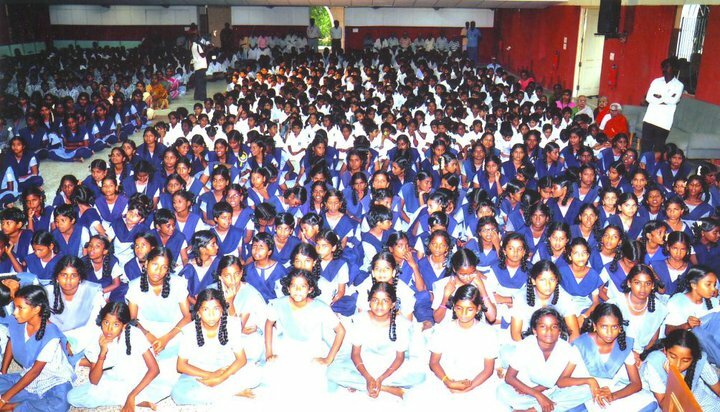 With the experience of more than 60 years of recorded services to thousands of poor orphans, Sivananda Orphanage effectively helps transform/grow these orphans to productive citizens. We not only provide food, education and shelter, but also instill character and morals to help them grow, learn and eventually become independent. Many, including former Prime Minister of India, Shri Pandit Jawaharlal Nehru have visited our ashram and witnessed our committed work. We currently look after 300 children and 80 elderly, all of whom are accepted and cared for with love and affection. Thirukkural (Tamil: திருக்குறள் also known as the Kural) is a classic of couplets or Kurals (1330 rhyming Tamil couplets) or aphorisms celebrated by Tamils. The Ashram has a dispensary in which a Doctor takes care of not only the kids & elders of the institution, but also the villagers of Chengalpattu MGR District. The organization runs both primary and high schools accredited by the State Government, which benefits the orphans and thousands of rural children in and around Chengalpattu MGR District. We have been successfully running a Matriculation school (in English medium) for the past few years as well. At the time of this catastrophe, Dr. S. Rajaram offered the Government of Madya Pradesh and the Government of India to adopt 50 affected orphan children. This entry was posted by admin on 13. November 2010 at 21:10, and is filed under Ayurveda, Sanskrit, SOCIAL PROJECTS, SPIRITUAL JOURNEYS, NEWS, Yoga. Follow any responses to this post through RSS 2.0. Responses are currently closed, but you can trackback from your own site.